Emil Landman is a songwriter I’ve known for a few years, because I’ve been listening to his music, but maybe even more so because Mailmen-producer Martijn Groeneveld couldn’t stop talking about him. Rightly so, because he is a really talented Dutch songwriter and that talent shows on his new record An Unexpected View. 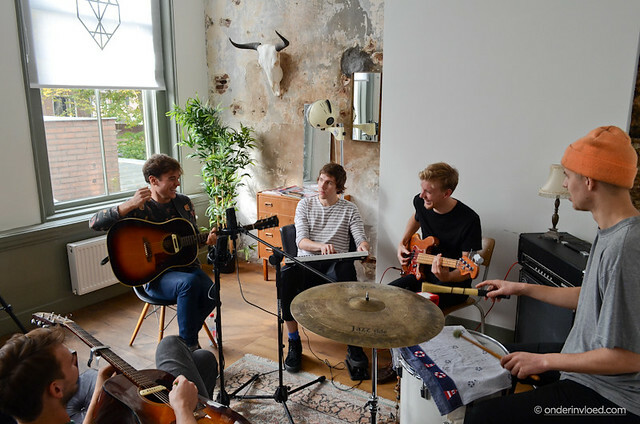 We filmed this session during the afternoon of his album launch at the wonderful venue EKKO in Utrecht and it was inspiring to see how much fun Landman and his band were having in the midst of steadily emerging nerves. His music has developed profoundly since his already strong releases A Bargain Between Beggars from 2013 and Colours And Their Things (2014). Last year he packed a bag, his guitar and some microphones and travelled across the world. Whatever he saw and experienced was turned into song and later recorded at the Mailmen studio. Some of them already are being used in commercials in Germany, Austria and Australia. Some personal favourites on the record are Our Bodies, Mercy and Closer which he recorded in this session. Please watch him play Thomas Dybdahl’s This Love Is Here To Stay with band and an intimate solo version of Grey Reverend’s Forsake at EKKO’s backstage room. Emil Landman and band are currently on tour in The Netherlands. For all of his upcoming dates, click here.